Nestled in the eastern Balkan Penisula at the crossroad between Europe and Asia, Bulgaria has been a melting pot of various world’s cultures dating back to thousands of years ago. With its long-standing history, Bulgarian folk music and dance, in particular, have been known to many, and at its very core, is the beats of traditional Bulgarian drum – tapan. Davul, tupan, however you may call it, depending on the area you’re based in, has been around since 2nd century AD. Curious about what authentic Bulgarian drum sounds like? 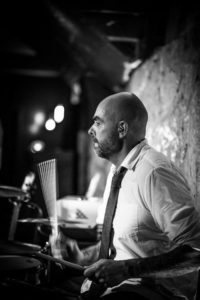 Mark down July 1 – Vancouver-based Bulgarian drummer Dimitar Karabov is bringing the heartbeat of Bulgarian music to you! Relocated to Canada in 2005, Dimitar Karabov has been playing drums for 25 years. An avid drummer, Dimitar is currently involved with many projects, including Vancouver’s very own Boy Breaking Glass, The Unified, Puppycat and Mouthful of Daisy. 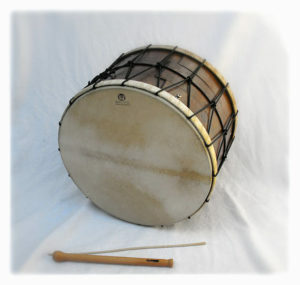 Tapan, also known as davul, tupan, atabal or tabl, is a large double-headed drum played with mallets. Its name stems from the ancient Greek word tympano. In the southern Balkans, the rhythm of the tapan is complex and utilizes many accents in numerous traditional time signatures. In Bulgaria tapans are most often used to accompany other instruments such as gaida and gadulka. They are also played solo in some folk dances and songs. For centuries the tapan is irreplaceable at Bulgarian village festivities such as weddings and celebrations of patron saints of homes and villages. The drum shell is made of hardwood, perhaps walnut or chestnut, though many woods may be in use depending on the region where the drum is made. The heads are usually goat skin, and they are shaped into circles by wooden frames. However, one head may be goat skin to provide a higher tone, while the other head can be sheepskin, calfskin, or even donkey-skin to provide a lower tone. Ropes are threaded back and forth across the shell of the drum, from head to head in a zigzag pattern, holds the heads on the drum and provides tension for tuning the drum. Sometimes metal rings or leather straps join neighboring strands of the rope in order to allow for further tuning. Two rings are sometimes attached to the main rope where a belt-like rope is threaded through to hold the drum.